70th Anniversary Special! * 10% off orders under $350 and 20% off orders $350 or more. *See details. Two 50ml split cartridges (100ml ttl.) Mixing tips. Does it all from conventional bite registration techniques to modern-day digital impressions. Bite registrations, matrices, model bases, bite plates and now CAD scanning capabilities—the uses for Blu-Mousse® just keep growing! For over twenty years, Blu-Mousse has been a favorite VPS material in dental offices world-wide. Originally intended as a bite registration material, Blu-Mousse has evolved into a VPS with a “can-do” attitude. It’s amazing the number of clinical applications this little dynamo truly has. For example, it’s an ideal material for use as a matrix when fabricating both direct and indirect provisionals. Blu-Mousse, when used with our low-viscosity die silicone Mach-2®, has seen incredible success with the Laminar Flow/Closed Mouth impression technique. Furthermore, it functions as a fantastic rigid tray material for tray-free impressions or stabilizing plastic quadrant trays when partnered with low-viscosity VPS materials like Parkell’s Cinch™ Light or our premium VPS, SHARP™ Wash. Blu-Mousse sets to a super-stiff hardness registering a 90 durometer. You can even use it to create a base on a Mach-2 die model in under 6 minutes! What else can Blu-Mousse do? Well, it turns out that we can add scannability to Blu-Mousse’s achievements. Use it as a tooth-positioning index on a C-Stat Camera Stabilizer (CEREC® D). Create a scannable occlusal index for CEREC® and E4D systems that is incredibly accurate down to the most minute detail. 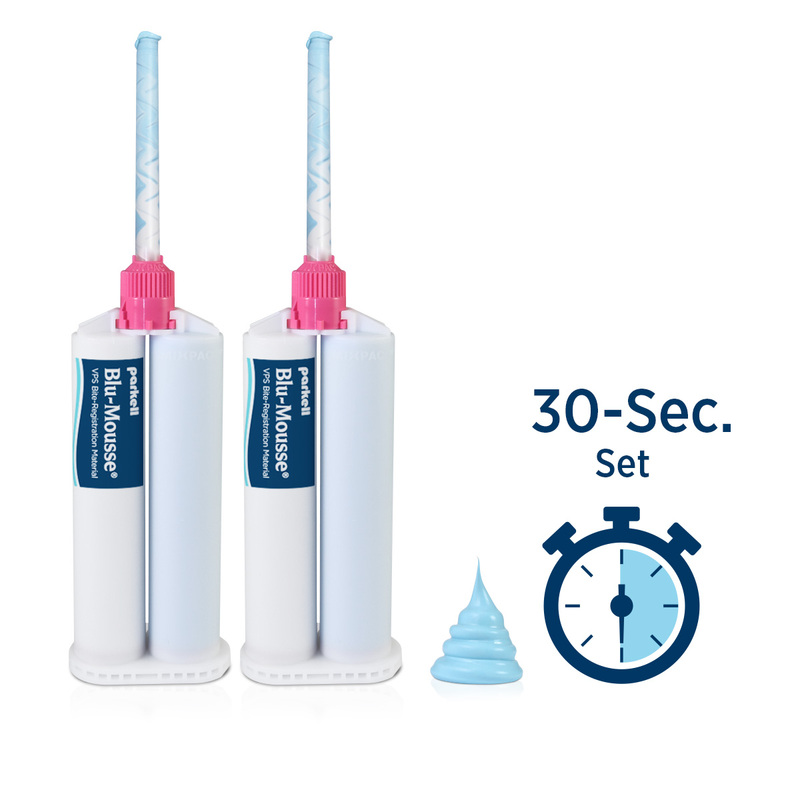 Of course, we’re proud to say that Blu-Mousse remains one of the most accurate, most stable bite registration materials in dentistry. And even though the versatility of Blu-Mousse seems limitless, it is still the light, fluffy VPS material we created it to be. With its whipped cream texture, it offers no resistance when a patient bites down, so it won’t trigger any reflexes that would affect the integrity of your bite registration. Trying to get an accurate scan on a prep for a CEREC crown, but you can’t gain good access to the tooth with your camera? Use Green-Mousse! When you use Blu-Mousse’s slightly less rigid sibling (Green Mousse registers a 60-durometer) as a tray material with a scannable wash material, CAD/CAM software users will get an impression that will easily and accurately scan. It is a great alternative impression system that can be used in areas of the mouth that may be too difficult to capture an accurate intra-oral scan. Green Mousse’s added flexibility allows for easier removal of registrations or impressions in patients with extensive undercuts or periodontal issues.